Patients were treated with escalating doses of d-19575 administered by a two-step (fast–slow) intravenous infusion over 6 h every 3 weeks. Thirteen patients received 43 treatment cycles (median 3; range 1–11) at d-19575 doses of 3,200, 4,500, or 6,000 mg/m2. Hematologic toxicities and other side effects were generally mild. The maximum tolerated dose of d-19575 was 6,000 mg/m2, at which two patients experienced dose-limiting toxicities (hypophosphatemia, hypokalemia, and metabolic acidosis each of grade 3). Pharmacokinetic analysis revealed a linear relation between the area under the concentration-versus-time curve (AUC) and dose. 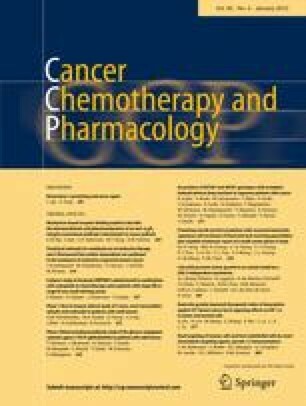 The AUC values for isophosphoramide mustard were substantially greater than those achieved by bolus administration or continuous infusion of ifosfamide in conventional therapy. One patient with gallbladder cancer previously treated with cisplatin and gemcitabine achieved a partial response lasting for >5 months, and eight patients achieved disease stabilization. Our results show that d-19575 can be safely administered by infusion over 6 h at 4,500 mg/m2 every 3 weeks. The safety profile and potential antitumor activity of d-19575 show that phase II studies of this drug are warranted.